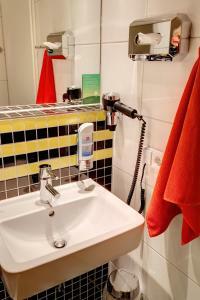 This superior hotel is just 800 metres from Frankfurt am Main Airport Terminal 2. It features a 24-hour reception with live flight information, soundproofed windows, and free Wi-Fi in all areas. The airport shuttle runs every 30 minutes from 05:10 until 23:40 from Terminal 1 and from 05:15 until 23:45 from Terminal 2. A transfer from the airport is free of charge. . Free pick up from the airport is at Terminal 1 bus station hall B exit 4 or 5, or Terminal 2 exit D/E number 8. Transfer from the hotel to the airport should be booked at the hotel and costs € 3.50 per person. Late check-out until 14:00 is available for an additional fee. This hotel does not accept American Express. Bright, modern room with a flat-screen TV and a private bathroom. Please note that different cancellation policies (see Policies) apply for groups of 11 people or more. The hotel will inform you of these policies following reservation. Bright, modern room with a flat-screen TV and a private bathroom. 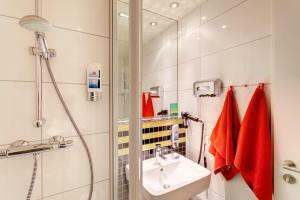 This room also offers extra space, and toiletries are provided. Please note that different cancellation policies (see Policies) apply for groups of 11 people or more. The hotel will inform you of these policies following reservation. Bright, modern room which has a flat-screen TV and an en suite bathroom. Please note that different cancellation policies (see Policies) apply for groups of 11 people or more. The hotel will inform you of these policies following reservation.